Q: (James_Bailey) What upgrades for the Fleet System are being considered in Season 6. Dstahl: If you are in a Fleet, one of the first new features that you will see in Season 6 is the new and updated Fleet User Interface. In addition to an updated Home Page, you’ll notice a new Tab for Fleet Holdings which will represent major projects that your Fleet has undertaken. The first of these new Fleet Holdings will be your Fleet Starbase. Once Season 6 goes live, Fleets may immediately travel to a specific system location and begin projects to construct and advance their Starbase. As players complete projects, they will earn Fleet Credits. As projects complete, the Fleet Starbase will undergo a transformation and unlock new rewards that players can spend their Fleet Credit on. In addition, new group focused missions are being added to help supply necessary items needed to advance your Fleet’s Holdings. Dstahl: We’ve decided to merge the Engineering Report with the old State of the Game reports. Ask Cryptic will be released at the beginning of the month and the new State of the Game/ER will be released at mid-month. So look for the State of the Game in a couple weeks. Q: (Alastor_Forthright) How will Fleets pay for and support their Fleet Bases? Will it be balanced so that Fleets that are small are not held to a disadvantage to larger Fleets with people constantly on? Dstahl: Fleets will need to gather existing items as well as earn new items, such as Fleet Marks, in order to contribute towards Fleet Projects. Depending on the project, the mix of items needed can change. Items needed can include physical items such as Weapons or Gear, Commodities, Dilithium, Duty Offices, Fleet Marks, and just about anything else you can find in the game. Once you’ve gathered all the materials and kicked off the project, a standard project construction timer starts. This also means that if you have all the materials, there is only so much progress you can make at any given time, given the time needed for the projects to complete. We have pulled a lot of statistics on what the average, active Fleet size is and we are ensuring that it is not impossible for small Fleets (which are the majority) to have a viable progression path. Q: (Armsman) What is the final decision regarding production of any future Featured Episode series for STO? Dstahl: One of the benefits of a MMO versus a traditional “ship it and you’re done” game is that there is no such thing as a “Final Decision”; we can add to the game continuously. We will continue to make awesome story content in Star Trek Online well into the future. While there is no Featured Episode series slated for Season 6 release, we have already started planning on the next chapter in one of the primary stories you’ve been following in the game. Whether we tell this story through Featured Episodes, or something even cooler, will be a mystery that you’ll have to ponder on for a little while longer as we focus on the new Fleet Advancement System and the new Fleet Challenges. Q: (Tricksterbro) Any new info on what new mission content will be coming our way in the next 6 months – 1 year? Dstahl: In addition to the new Fleet Challenges and Tholian missions being added in Season 6, we are in the process of scheduling out the details of Season 7 and up through our 3rd Anniversary. Other than saying that Season 7 will be focused on Story, there aren’t any details that we are going to be sharing at this time. Q: (Commadore_Bob) The community seems to have latched onto the Ferasans. Any chance we will see some more Ferasan-specific additions (Ships, missions, weapons, etc.)? Dstahl: We are thrilled that so many players enjoyed the new KDF playable species. While we don’t have any specific plans for Ferasan ships or gear at the moment, now that the species is represented in the game, we will have the opportunity for future story-driven content to flesh out their backstory or contributions to the Klingon Empire. Q: (Maxxina) What is the official launch date of Season 6 on Holodeck? Dstahl: No official launch date yet. Keep an eye out for announcements about Season 6 going to the public test server (TRIBBLE). Q: (Roman12291969) Is there any way the Galaxy map can open up, and make that real time? Where fleets can really have a stake in what’s happening, and you can actually fight for key sectors? Dstahl: The ideas about having a territory control game or one big sector are exciting to the team. This is one of those features on our to-do list, but it’s not on our current schedules. We have several steps in-between planned in order to get us to a place where we could do that. Having Fleet operated Starbases is one of those steps. Q: (Lord-Ice) Is it possible that we’ll ever be able to assign our Bridge Officers to command our alternate ships as AI Space allies? Dstahl: We have toyed around with the idea that you could assign your First Officer as Captain of one of your other ships and thus have something that is similar to an away team in space, where your Bridge Officer follows you to assist. We believe that this concept fits best with the eventual release of the Admiral rank and are saving it for consideration at that time. Q: (KBFLordKrueg) When are we going to get new, non-time gated, not-mandatory 5 man, KDF faction playable missions? Dstahl: This topic has been discussed quite a bit over the last year, and the current plan is to focus efforts on expanding the game at higher levels for both factions. While Season 6 does have many Fleet oriented missions requiring fleets of more than one player, there are a few solo missions that will be available as part of the release of the new Tholian enemy faction. While we have released solo KDF missions such as Alpha earlier this year, the team will continue to focus on mission based content new to both factions. 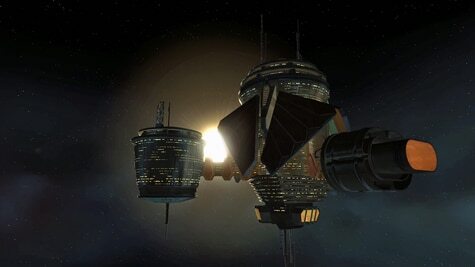 Q: (KnightTemplar_99) Is there any future plans for more sectors, particularly in the Alpha Quadrant? … the majority of the Federation is in the Alpha Quadrant, yet the game itself is about 80% Beta Quadrant. Dstahl: We have plans to add sectors to both the Beta and Alpha Quadrant that will open up as we advance the Romulan/Reman, FED/KDF war, and Iconian plots. By the time we’ve touched on those stories, the galaxy map will be more representative for the factions currently in the game. Q: (Kingdox) Are there any more shuttle missions, beyond the newest Vault event, being worked on? Dstahl: Before we add any more shuttle specific missions, we want to add some tech that will allow players to select a default “small craft” for missions. This would allow you to queue for missions like the Vault without needing to swap back and forth between your ships and wait for the queue to fire. Once that is in, we plan to add more gameplay that will take advantage of that. Q: (Body_Surfer) Who is the target audience for STOs continued development? Long Term players who will make STO their game of choice for years, or short term players who will play for a few months and move on? Dstahl: There is no target audience other than the people who like to play STO. We will continue to develop this game for the foreseeable future to ensure that all STO players (past or present) have new and exciting challenges awaiting them the next time they log in. The more we can focus the game on Star Trek, the better. Whenever we release a new Season of Star Trek Online, it ushers in a wave of new features and additions to the game. Our team is currently crunching on the release of Season 6, and as soon as that is released, we will immediately begin work on Season 7. In between the Seasonal releases, you will continue to see small updates made to the game in the form of C-Store releases and minor events. When most of your players aren’t paying a dime to play the game, this allows us to maintain our staff and continue to deliver the best Seasonal Updates. Now that we’ve nearly filled all of our open positions, my expectation is that Season 7 will be the biggest single update we’ve made since we launched the game. Q: (N.Bridger) PWE said Cryptic Studios is their R&D. What does that mean for us the players? Dstahl: While I only speak for STO, here is my opinion on that paraphrase: Perfect World Entertainment (PWE) is the North American subsidiary of Perfect World Co., Ltd (PW). As a regional office, PWE is responsible for developing and publishing games that work well in the markets they serve. Up until the acquisition of Cryptic Studios, PWE relied on localizing games that had been developed by the PW office or other 3rd Party Studios. By purchasing Cryptic Studios, PWE not only gained a development studio with experience in F2P MMOs, but also gained a studio that is in close proximity to their office. This allows us to meet and collaborate on current and future MMO products that are specifically designed for PWE’s target market of North America and Europe. The fact that Cryptic already brings to the table the F2P MMOs of Champs, STO, and NW is icing on the cake. As a player, this means that PWE is investing Cryptic Studios to not only deliver quality new F2P MMOs built from the ground up for this market (e.g. Neverwinter), but to also develop new products that pursue the future of MMO gaming. It is a great partnership in my opinion. Q: (Jared1701) Are there still plans to bring crafting, a working shuttle bay, and new mini games to ship interiors and if so when? Dstahl: These items had shown up in previous Engineering Reports as designs we were discussing and wanting to put in the game, but are not currently being worked on. At this time, we are focused on Starbase interiors. Neverwinter is working on a Foundry addition to build custom interior spaces (room by room). Once this feature is done and ready, we will have the opportunity to import something similar into STO. At that time, we would consider opening up the ability for players to fully customize their own ship interiors room by room and prop by prop. That is a ways off at this point, though. Q: (LtSmith) Will we see more content involving the Undine? After all, I though the whole background of STO was about the Undine infiltration after reading the novel “The Needs of the Many” and reading about the game back during beta. Dstahl: There are several stories in STO that are key elements of future updates: the Undine and their relationship to the Iconians (as well as the location of Sela), The FED/KDF war, and the fallout after the destruction of Romulus – will there be a Rom/Rem civil war? So while Season 6 is focused primarily on Fleets and the introduction of the Tholians, future Seasons will begin to address some of these outstanding story elements. At the moment, our PvP focus is on improving space combat because that is where the majority if PvP is taking place in STO. Once we are happy with improvements being made to Space PVP, we can begin the process of analyzing how to make Ground PvP better and more in line with the match types you see in other MMOs. Due to the server/client nature of MMOs and how players maneuver in the game engine, we do not expect to see true FPS mechanics in STO. The current implementation of Point and Target is the closest STO will get to FPS. Q: (GT01) What happened to the extra Android BOFF options? We were informed that we’d not only get male and female Androids to choose from, but that we’d also have Tactical and Science branch officers to choose from too. Dstahl: This question required some investigation to determine what happened. Turns out that at the time there was an issue that prevented those additions from happening. That issue appears to be resolved in Season 6 and so now it boils down to having one of the developers revisit this and put in the options. Q: (Direphoenix) We never got an update as to the status of the various faction comm badges we were previewed in May. What happened to them? Dstahl: The Art Team working on STO is awesome. They do a fantastic job of bringing as much Star Trek detail into the game as possible. An artist may see something in Star Trek and have a strong desire to see how that would work in our game. This leads to a lot of pre-production and concept art sitting on the raw game archives. Take the Borg Queen for example. You’ve seen her for over a year and yet she isn’t in game anywhere yet. By having tons of Star Trek props and concepts premade in 3D, the art team is able to brainstorm proof of concepts to convince people like myself that specific items you see in Star Trek could be added to the game. The comm badges that were twittered over a year ago are great examples of some of this pre-production art. They exist on the raw art archive to show that we could add these badges to the game, but as of yet we’ve reserved them for use in the future. Q: (Kirkfat) Players don’t really get rewards for playing some of the best story missions in the game (via the Foundry). Will this ever change? Dstahl: As a prolific Foundry author, you bring up a valid point about rewards. The answer is yes, it will change. We have always wanted to find the right way to offer rewards for Foundry missions without leading to abuse of the reward system. Our temporary solution is to start featuring Foundry content similar to what you’ve been seeing in the in-game bulletins as the Foundry Spotlight. Based on the success we’ve had with this low budget form of promoting Foundry missions, we plan to make it a full blown feature in the Mission Journal. By doing so, Foundry Spotlight missions will be setup similar to how Feature Episodes are promoted within the Journal. This will allow us to attach premium rewards to specific player made content that is being featured. This also allows us to prevent abuse of the reward system, while rewarding high quality player-built missions with excellent rewards so that players have even more incentives to play them. There are some technical features required in order to make this happen, but we have already started the ball rolling to get this in shortly after Season 6 releases. Q: (Q400) When will we see any major changes to the Foundry? Dstahl: Well that depends on what you define as “major”. In Season 6 we are making a massive overhaul of the underlying code that makes the Foundry work, but my expectation is that players are not going to deem this as a “major” change. The reason we are making this overhaul is because we want to inherit all the cool new Foundry features that have been and are still being made for Neverwinter. Without making this overhaul, the Foundry code between the two games would continue to diverge and make it more unlikely that we would ever be able to include new features such as editing interiors room by room. With the wealth of amazing Foundry content that has been made over the last year, our number one priority for Season 6 is to ensure that existing Foundry missions are safe and secure as we shift around the underlying code. Season 6 will bring some new assets, maps, UI improvements, and minor editing features, but the bulk of what you might consider “major” Foundry changes will not happen until after Neverwinter completes the cool features for their launch build. For any STO Foundry authors who are eager to see what these major features might be, it is in your interest to do whatever you can to get into the Neverwinter Beta (with Foundry) to see what has been added and make suggestions and provide feedback since these are the features that will be making their way to STO once they are ready to ship. Q: (Gornman47) After the KDF is brought up to par with the Federation, then make the Romulan faction and devote 2 Seasons to developing them please! What are your thoughts on this? Dstahl: Are we going to go back and make a KDF tutorial? Are we going to add enough content to take a new KDF player from level 1 to 18? Will we ever be able to play a KDF as our first character without having to level up a Fed character first? When can we play a Romulan? These are all great questions and ones that have been discussed frequently in prior Ask Cryptic articles as well as the STO Forums. In the past, I’ve been party to a lot of that speculation by talking about it frequently in both the Engineering Reports and on the forums. It is often fun to discuss open issues like this with the player base to get feedback and see reactions to ideas that are proposed. Unfortunately, it has also led to a lot of frustration and expectations that are skewed and or informed on old discussions. Season 6 will be the first step in answering this question. It will involve a new Fleet Advancement System and new repeatable content that is only accessible by max level players. It introduces Tholians which, to begin with, will only appear in max level content. It also sets the stage for some of the stories we want to tell that will involve both factions as we move past max level. So where do the Romulans fit in all of this? We’ve been thinking about this for a long time. We have a plan. You’ll just have to wait and see how it plays out. Until then, you’re not going to see me talk much about it or speculate about what could be until it happens. Dstahl: As it is now, missions are designed with difficulty scaled for a specific maximum number of bridge officers. We chose five in the early designs of the game because it fit well with IP, and thus the UI is designed for a maximum of 5 characters. This also means that all of the possible enemies that you fight in the game are also designed to scale up to a maximum of 5 characters. So in order for us to increase the maximum number of Boffs beyond 5, it would be a pretty significant undertaking that requires updating a lot of various data all throughout the game. That said, we do often make specific decisions to disallow Boffs on some maps. T is where we will take your questions and feedback, and consider whether or not we would ever allow players to run STFs with their Boffs or not. In some cases it would require changes to how mission logic is written, but it’s not out of the realm of possibility. Q: (diogene0) We need more Foundry versatility. Why not release something closer to what the current mission builders use? We could make custom interiors, ground maps. Do you fear that players could do a better job than your team? Dstahl: If you are referring to allowing the ability to “MOD” the game, then it becomes an issue of security and maintaining strict control of our assets. Our goal with the Foundry was not to create a MOD tool, but to allow players to use something very similar to our in game editor to write their own missions using existing assets. This allows missions created by players to exist in the same game world as the live shard. That said, the Foundry teams are working on toolsets that will allow more flexibility in designing interiors and possibly even ground maps. You’ll see some of these features in the Neverwinter Beta with the goal of having those features trickle into STO in the future. Instead of fearing what players can do, we encourage players to spend the time making content that is awesome. By doing this, we have one of the most amazing player driven content communities out there. Our goal is to keep providing tools that will allow players to build even more complex and beautiful missions in the future. It also has led to some job interviews for players who have made some great missions. Q: (PhyrexianHero) When can we expect to see a Betazed sector? Trill? Ferenginar? Dstahl: The Alpha Quadrant sector you are referring to is one of the sectors we have on our schedule for a future update. While I can’t go into further details as to when it will be released, we already have a sector map laid out and locations selected. You’ll have to stay tuned for more details in the future. Q: (Sean2448) Will STF standard gear ever be tradable between characters on your account? Dstahl: The Omega and MACO rewards are something that have come up recently in our discussions around economies that we want to clean up and reward structures that need to be improved. Not only is it complicated to earn all the tokens necessary for the rewards, but it is cumbersome on your inventory. This is something we plan to overhaul with something very similar to how the new Fleet Advancement system will work. Once that system is live, we can begin development on a way to clean up the STF rewards and how the STF economies work. Q: (Fleet_Admiral_Joy) Will you ever add archiving into the Foundry so we can save our maps and costumes without having to keep importing? Dstahl: Your frustration has been heard. While working on the Foundry in Neverwinter, this was one of the top requests that the development team is keenly aware of. While they haven’t promised anything specific, there has been a lot of discussion about libraries and shared assets to simplify the process of sharing and storing work, rather than the need to pass around text files. There is no ETA on when something like this would happen, but the best news I can provide is that it is a very popular feature request with the team. Q: (DTums) Are there any plans to expand content or rewards for gold members? Dstahl: We do plan to introduce further Gold member benefits as they make sense. For example, the Account Shared Bank is a C-Store service being released this month and will come with some free bank slots for Gold members past and present (you’ll get the slots even if you are currently Silver but were at one time Gold). Q: (Cuatela) Do you have plans to update existing costumes like allowing sandals to be worn with the Warrior’s Skirt or add new costume options like bare feet or both FED and KDF? Dstahl: There are no specific tasks on the Season 6 schedule to do this, but these are great suggestions and I’ll forward them to the character art team. They will often take suggestions like these and other posts made in the Character Art forum and incorporate them into updates we make in the future. Q: (mindwipecjg) With the upcoming Fleet Starbases can we look forward to an option where you can gain additional duty officer missions? Dstahl: While we are still finalizing the details of how Duty Officers connect with Fleet Starbases, we can say that Duty Officers will be a requirement for the completion of Fleet Projects. We also expect Duty Officers to be involved in the earning of additional Fleet Marks. There are no specifics on whether that means additional duty officer missions yet. This is the kind of feedback we’ll be looking for when the Fleet Advancement system and Season 6 hit the Tribble Test Servers this month. Q: (starlazers) Are there any plans to add new STF Space sets to the STF store or even just new space sets to the game with S6 or soon after? Dstahl: The new Fleet Advancement system has a whole list of projects that need to be completed. Every project and every unlocked tier of your Starbase will open up new rewards. If you want to confirm whether or not this includes a new space set, then you’ll have to check out the system for yourself when it goes to Tribble this month!